Crow T Robot: Please contact me if this one is rtesolved. Thanks. 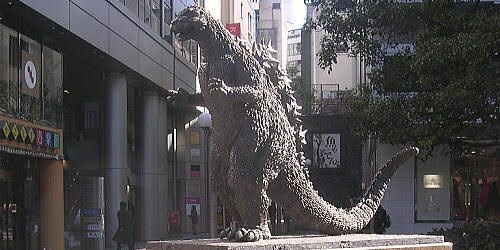 "Godzilla" image made in front of Hibiya Chanter considerably in the round stands soon walking from Hibiya line "Hibiya" station. As for the length, a great serif by Dr. Yamane "It cannot be thought that this Godzilla is the last one" is carved for the plinth by about 1m. It was built that this Godzilla image had been built in commemoration of 'Godzilla VS [desutoroia]''s open to the public in 40 only 1995 year from the Godzilla birth. The pen doesn't enter the cash container, and have the pen, please.